She is best known by her pen name, Mrs. R.L. Devonshire, under which she wrote Rambles in Cairo (Cairo, 1917, 2nd ed. 1931). She also wrote various more scholarly books and articles, in English and French. The online catalogue of the Library of Congress lists several French books translated by her into English (also as Mrs. R.L. Devonshire), and descriptions of books for sale online lead me to believe that these translations were all first published before she moved to Cairo with her family. 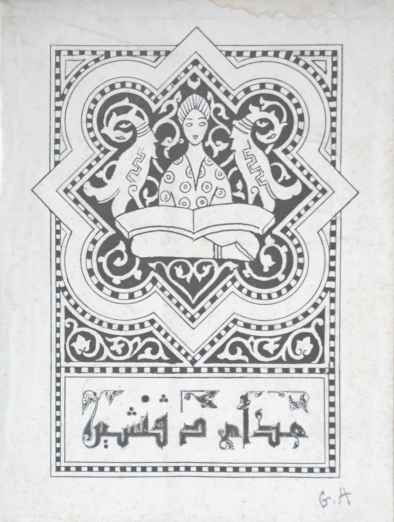 The book to which the bookplate is attached was published no earlier than September 1921 (the date of the dedication to the Sultan), so she acquired it after the death of her husband, a prominent legal advocate, in June of that year. She styles herself “Madame Devonshire” because she was French. An appreciation of Henriette Devonshire by Annalise Kinkel DeVries is online as of November 2012 as “The indomitable Mrs. Devonshire”, and further information about her life may be found in Samir W. Raafat, Maadi 1904–1962, 2nd ed., Cairo, 1995, pp. 35–36, 76, and 198.